I first went to Shetland more than thirty years ago. I’d dropped out of university and was offered a temporary job as assistant cook in Fair Isle bird observatory. At that point I wasn’t even sure where Fair Isle was, though I’d heard of the famous knitting; I thought vaguely it was one of the western isles. But Fair Isle, Britain’s most remote inhabited island, is part of the Shetland group and that’s as far north as you can get in the UK, closer to Bergen in Norway than London. Fair Isle is a long way from anywhere—13 hours overnight by boat from Aberdeen to Shetland mainland and then three hours by mail boat into the Isle. So I arrived on a stormy spring afternoon to be assistant cook in the bird observatory on Fair Isle, knowing nothing about birds and not being able to cook! I was twenty years old and looking for adventure. That summer changed my life. I met my husband there. I had the space and the time to read more widely than ever before. And I learned to cook. The next year I went back—only this time I was in charge of the kitchen. Fair Isle is about three and a half miles long and a mile and a half wide. It has a permanent population of about 50 people, an airstrip, a natural harbour and a hill covered with heather, where the aggressive skuas breed. The cliffs provide homes for puffins, kittiwakes and gannets. Because of its position it attracts rare birds from east and west. The people live in a scattering of croft houses in the south of the island and are warm and welcoming to incomers. I spent my time off in gossip and listening to stories. I learned to hand milk a cow, clip a sheep and even to knit—never did quite get the hang of the intricate steps of the dances though! Shetland itself comprises half a dozen or so inhabited islands. Shetland mainland is 60 miles from top to toe and the archipelago has a population of more than 20,000. Check out the map on my website for more details and to see where the books are set. There’s a town, Lerwick. Oil came to the community in the 1970s bringing affluence, work and foreigners. All this makes it an interesting place to explore, imaginatively and in reality. Since that first trip, my husband and I have been regular visitors to the islands. We have very good friends there. But I didn’t consider setting a book in the place until 2005 when we made a brief mid-winter visit. A very rare bird had turned up between Christmas and New Year and Tim was desperate to see it. We arrived to snow and ice. There are few trees in Shetland so the landscape was bleak and bare. Looking across the frozen fields we saw three ravens against the snow. I’m a crime writer and I thought if there were blood as well it would be like a scene from a fairy story: powerful, almost mythical. That was how Raven Black was born. I’m very grateful to Shetland. I’d been published for twenty years before Raven Black, to reasonable reviews but very little commercial success. The book went on to win the CWA Gold Dagger, be short-listed for the Martin Beck Award in Sweden and to be translated into nearly twenty languages. It’s been optioned for television and adapted for radio in the UK and Germany. Shetland obviously caught the readers’ imagination, just as it had caught mine. Quite soon I decided that I’d write a quartet set in Shetland. The islands lie so far to the north that the seasons vary dramatically. Winter and summer are very different. In winter it’s dark for most of the day. In summer it’s light almost all night. In June you can read a newspaper outside at midnight. The sun slides towards the horizon in a strange kind of dusk and then rises again. Shetlanders call this the simmer dim. The autumn equinox brings storms and early spring can be wet and gloomy. Red Bones is set in the spring, a time of mist. The story is about digging into the past—literally in an archaeological dig of a mediaeval merchant’s house, but psychologically too. It’s about greed and envy, set on Whalsay, which is the wealthiest island because most of Shetland’s deep sea fishing boats moor there. There’s a series detective who appears in each book. Jimmy Perez is a Fair Islander—his exotic name comes from his Spanish ancestry. There is a real Spanish armada shipwreck off the island and there were survivors. I wanted my character to be an outsider, but also to utterly belong. His family has been in the islands for five centuries but still he’s viewed with suspicion. Now I’m preparing for publication of the fourth book. In Blue Lightning I go back to Fair Isle, where my passion for Shetland all started. I found it a remarkably easy book to write, because the landscape of the island is fixed in my imagination. I’ve created a fictional field centre in the lighthouse at the north of the Isle and one of my characters is the cook there. The autumn gales mean that no planes or boats can reach the place, and when a body is found, Jimmy Perez, on holiday with his parents, has to work the case without any technical support. Now that the quartet is complete, will I return to Shetland in my writing? Of course! There’ll be a gap, because one of my Vera Stanhope novels has been adapted for television and it makes sense to concentrate on her for a while, but Shetland is a very special place. It’s impossible to stay away. Ann Cleeves lives on the northeast coast of England with her ornithologist husband Tim. Her latest Shetland novel Blue Lightning is being published by Minotaur in the fall of 2010. For one reason or another, islands have always played a big part in my life. The first family holidays I can remember from my childhood were spent at Millport on the Isle of Cumbrae in the Firth of Clyde—just a short sail “doon the water” from my home city of Glasgow in Scotland. During my time as a producer of British television drama, I spent five months a year for five years living on the island where we were filming the drama series I had created for Scottish Television. That was the Isle of Lewis, about as far northwest as you can get in Scotland. And in that strange way that life has of bringing things around in circles, I am writing this from the island of South Uist, in the Scottish Outer Hebrides. If I look up, I have a view from the kitchen window across the Sound of Eriskay towards the Isle of Eriskay, and the island of Barra beyond. What am I doing here? Well, I am researching the second book in a trilogy of dark psychological thrillers set among the islands of this archipelago. The first in the trilogy, The Blackhouse, was initially turned down by all the major publishing houses in the UK when I first wrote it four years ago. But when my French publisher read it, she liked it so much she bought world rights, and has since sold it all around Europe. It has now been bought by the hugely successful London publisher, Quercus, which is now negotiating its sale to the US. It has already been published to rave reviews in France where it has won one prize and been nominated for three others, and will appear in English for the first time in February 2011. The story takes place on Lewis where I spent all those years filming. Central to the plot is the annual pilgrimage made by twelve island men to yet another island—a storm-lashed rock out in the North Atlantic, where the object of the trip is to slaughter 2000 young gannets. A tradition born hundreds of years ago out of the need to feed families back home, it is now a testing right of passage for the youth of the island. Publishers liked the setting so much, they offered me a three-book contract to spin more tales of island life. So here I am, back among the islands exploring the depths of the island psyche, and trying to understand why man would choose to isolate himself on fragments of rock surrounded by often angry and life-threatening seas. Perhaps it is not so much a question of choice, but rather an accident of birth. For me, however, the setting was very much one of choice. And not only did I choose the islands of the Outer Hebrides as the setting for my trilogy, but the fourth book in my Enzo Files series, Freeze Frame, which came out in March, also has an island setting. This time it is the Isle de Groix, a tiny island in the Bay of Biscay, off the coast of Brittany in France. And what drew me to these island settings, I think, was that very sense of insularity and isolation that comes with island life. A perfect, enclosed world for a mystery or a thriller. Here we have self-contained communities, often guarding secrets, hostile to incomers, mysterious and unfathomable to the outsider. What better environment for exploring the human condition, putting it under the microscope, and testing it to the full with all the intensity that a murder investigation brings to the page. In a sense it provides a slightly expanded version of those closed and enclosed worlds explored in the country house murder mysteries of the Golden Age. Claustrophobic, almost suffocating, and yet compelling for both writer and reader. As a writer I have loved, and am loving, the island experience. And it has brought one or two unexpected side benefits. Having won the “Prix des Lecteurs” (readers’ prize) at the Le Havre crime writing festival in France in June, for the first of my island trilogy (L’île des chasseurs d’oiseaux in French), I was immediately invited to participate in a festival of island crime writing on yet another Breton island, L’île d’ouessant. And this followed hot on the heels of still another invitation, to another island crime writing festival, this time on Mediterranean island of Corsica, birthplace of Napoleon Bonaparte. 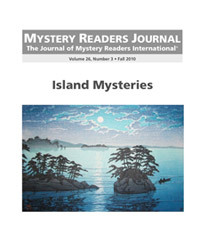 I had no idea that so many mysteries and thrillers had island settings, or that they were celebrated in this way by the islanders themselves. But having already written two, and with another two in the pipeline, I think I know why. I only have to lift my head and look across the shifting light of the water outside my window, towards the shadows of yet more islands half-hidden in the haze, to feel their irresistible draw. Peter May is the award-winning author of sixteen novels including two series, the China Thrillers and the Enzo Files. May’s standalone thriller, Virtually Dead, set in the online world of Second Life, was published in January 2010. May won the French Prix Intramuros in 2007 for his book Snakehead. When someone asks what I like most about Mykonos, what draws my heart to make this Aegean Greek island my home for seven months each year, my answer is easy: the people. I could list its traditionally mentioned three natural treasures—the mystical light it shares with the nearby Holy Island of Delos (birthplace of the god of light, Apollo), two dozen beaches more beautiful than a child’s dream, and the blessed winds that give this place both its nickname and much appreciated relief from summer heat—plus, of course, its legendary 24/7 in-season lifestyle, but for me, it’s definitely the people. Every day I wake up with a plan, but life here is less about carrying out plans and more about calls from local friends asking, “Jeffrey, can you meet me in five minutes at… ” Whether it’s the port for a coffee, a beach for a swim, a boat for fishing, a church or home for a family event, or some other place for some other reason, the purpose is always the same: to make me part of their lives, and they part of mine. So, once again it’s time to gather up my gear and head for the boat or grab my wallet and head to town. Whatever I end up bringing, too often it doesn’t seem to matter. Either the fish are hiding when I dive to catch them or the check is missing when I try to pay. I blame it all on my Mykonian friends. I also hold them strictly accountable for too many late nights, endless eating (and drinking) at one panegyri (a festival in honor of a saint) after another and, of course, for making it so hard to leave in November. I’ve stood with friends from midnight until two-thirty Easter mornings crammed into an ancient church’s tiny second-floor attic space mesmerized by services in the chapel below. I’ve danced at their weddings, rejoiced at their baptisms (on occasion to both on the same day), and cried at the funeral of my best friend. Mykonos is a place of wondrous energy and contrasts, and though I was not born there and my roots are not Greek, it is where I call home more than any other. No matter where my Chief Inspector Andreas Kaldis novels might take him in the world, each in some way brings Andreas back to Mykonos—much the same as each adventure seems to require my return for its creation. Murder in Mykonos was my first book in the series and I conceived and wrote most of it there. The story I wanted to tell was about the rich past and colorful present of an island that is every bit the legendary fantasy that draws tourists from around the world, yet at its heart remains a small Greek island village where people raise their families and share strong traditions forever linked in geographic and spiritual kinship to the Delos of antiquity. But I don’t write about summer Greek tavernas, pelicans, or windmills. I like to write fast-paced mystery-thrillers predicated on facts that make the jump to the unimaginable seem not that far. So, that’s how I decided to drop a serial killer into the middle of my island paradise and turn Mykonos’ Mama Mia-style setting into a No Country for Old Men sort of story. Many thought Murder in Mykonos would be my first and last on the island; that I’d be tarred, feathered, and run out of Greece. After all, expatriate writers in other lands had that experience when exposing their foreign Eden to the pen (or the MacBook Air, in my case). But I felt I had no choice. I’d left my successful law practice in New York City to move to Mykonos and write full time, so if I didn’t write something about Mykonos my local friends would think I was only claiming to be a writer, perhaps to hustle tourists into buying “the local writer” food and drink—now that I’d given up my paying job. With the warm reception that book received, I knew I’d write another but decided not to test the goodwill of my island friends by placing more murder in our paradise. Instead, I moved Chief Inspector Kaldis on to Athens. In Assassins of Athens, the body of a boy from one of Greece’s most prominent families turns up dead in a dumpster outside a notorious Athens bar, and Andreas’ investigation takes him deep into the glittering world of Athens high society where age-old frictions between old money and new breed revolutionaries and political realities once thought unimaginable. In the US it’s been “called international police procedural writing at its best” (Booklist, starred review) and in Greece “prophetic” for anticipating the country’s current turmoil and attitudes. But where do I dare go now? I’ve written about island life and politics, and the relationship between Greeks and their government. To me the choice is obvious: Greece’s unwavering faith in God and unique commitment to the Eastern Orthodox Church as an integral part of its way of life. A writer on things Greek can no more ignore that subject that a surgeon can ignore the heart of his patient. And so, in January 2011 Poisoned Pen Press will release Prey on Patmos (titled An Aegean Prophecy by Piatkus Books in the UK): When a revered monk from Patmos’ thousand-year-old monastery of Saint John the Divine is murdered during Easter Week in the town square of that holy island (where Saint John wrote the apocalyptic Book of Revelation), Chief Inspector Andreas Kaldis must find the killer before all hell breaks loose… in a manner of speaking. Andreas’ impolitic search for answers brings him face-to-face with a scandal haunting the world’s oldest surviving monastic community. On the pristine Aegean peninsula of Mount Athos, isolated from the rest of humanity, twenty monasteries sit protecting the secrets of Byzantium amid a way of life virtually unchanged for more than 1500 years. But today this sacred refuge harbors modern international intrigues that threaten to destroy the very heart of the Church… in a matter of days. Am I risking being as politically incorrect as Chief Inspector Kaldis? We’ll see, but it’s where my writing has taken me—or rather it’s where the Greek people have led me to follow from my island home. To all of them, my heartfelt thanks. Jeffrey Siger (www.jeffreysiger.com) was born and raised in Pittsburgh, Pennsylvania, practiced law at a major Wall Street law firm, and later established his own NYC law firm until giving it all up to live full-time among the people, life, and politics of his beloved Mykonos and write his Greece-based, Chief Inspector Andreas Kaldis mystery-thrillers. His work is published in the US, Greece, Germany, and UK and Commonwealth countries.